You can turn off your Linux system in multiple ways, but the safest one is by utilizing the shutdown command. As soon as you initiate shutting down, the system will send a message to inform other users who are logged-in, and it will prevent new logins. Let’s take a look at how you can put Linux shutdown commands to good use and maximize their benefits. We have always believed in practical examples, but we are aware of the importance of the theory. That is why we will first learn the basic syntax of the shutdown command. [OPTION] – You can choose to turn off the system, but also to reboot it when necessary. [TIME] – Specify the time when you want to initiate the command. [MESSAGE] – Inform other users on why you are shutting down Linux. Do not forget that you will have to use the “sudo” prefix to execute the command with the super user permission. The above line will order the system to initiate the shutdown in 60 seconds as that is the default time delay when executing the command. That command will initiate an immediate shutting down process. The turning off process will start in 30 minutes from the moment when you issued the command. You can change the number “30” with any number of minutes you desire. Calculating the number of minutes when delaying the shutdown can be a hassle. How about using a particular time then? Keep in mind that the system clock is the one that is relevant for this command. If you have multiple users registered on the system, you should inform them before you turn off Linux. It is a nice thing to do as you do not want to stop them in the middle of an important task. If you want this command to be successful, make sure to include the time delay, too. And do not forget the quotation marks before your message. As for the content, it can be anything that comes to your mind. You can add a custom message, as well as the desired time delay. sudo shutdown -c "Reboot canceled"
The Linux shutdown command is one of the easiest to use, but you should take advantage of that to turn off your system safely. 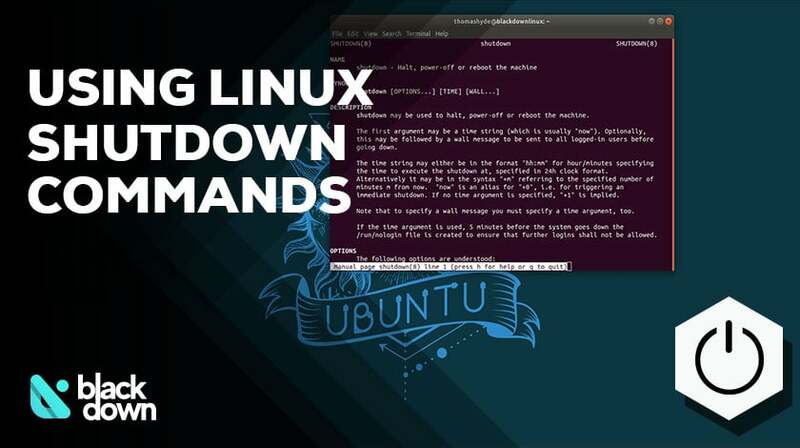 We hope the article covered everything you wanted to know on the topic, but in case you need additional information, type “man shutdown” to get an overview of the utility in the command line.